Most of the talk at today's Battlestar Galactica panel was on prequel series Caprica and TV movie "The Plan." 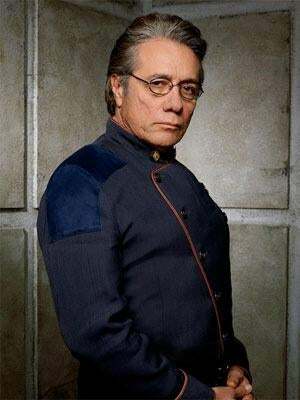 But Edward James Olmos revealed that even after The Plan has ended, he's not done with Bill Adama. As a matter of fact, I've got to tell you right now. Because of you all, what you're doing, because of the love for that world...I can guarantee that this will not be the last movie. Olmos told the press roundtables he believes the "Plan" DVD will sell so well, the economics will guarantee more movies. Plural. And he notes that they photographed the Galactica sets in insane detail, so they can recreate them digitally any time they want. In fact, I've got the entire script around them. I know exactly what happened to him. Let me put it to you this way: when we next see Adama, it will be in a very rustic log cabin and there will be a knock at the door and it will be his old friend Colonial Tigh saying, "We have a problem." If you watch the series from the beginning, the miniseries to the end. The last thing that David wrote, Trisha, Number Six, says, "This has all happened before and it will happen again." And Baltar says, "Maybe it won't. Maybe we'll learn." At that very moment, I want to put Blade Runner in, and you'll see a direct descendant of Adama take on the Replicants. While it's unlikely that either idea will make it to the screen, it's clear that the gears are turning in Olmos' head for a new BSG project. and at the press roundtables for "The Plan," Olmos elaborated on his idea that BSG is really a prequel to Blade Runner — making Caprica a prequel to a prequel. The ending of BSG "led right into Blade Runner like a glove." When you've watched the full run of both Caprica and BSG, "you're going to be able to lay it down and it runs into Blade Runner." So what's going on in "The Plan?" Olmos says it started out feeling like a clip show, but then they pounded on the script until it became a coherent story that will take your breath away and make you want to watch the whole show from the beginning, all over again. He made sure your pressing questions were answered — including one question that nobody had thought to answer originally: Who put that note on Adama's desk? We'll discover the truth at last. We were looking for a point of view of to do in "The Plan," with the concept of doing the Cylon point of view on the first couple of years. He was a natural fit to do that with, [and it] helped solidify his mposition in the mythology of the show.